Speaking of real estate, as we are about to enter the seasonally strongest period of the year (where the housing bulls will chirp about the imminent recovery as they do every year) but the data suggests more of the same. Existing home sales are far more important than new home sales, as they make up 90%+ of the transactions and the data this morning for April in a word stunk. As always, one should compare real estate YEAR over YEAR rather than MONTH over MONTH - something that trips up the housing bulls who always get excited the past few years in May, June, July (when housing data ALWAYS turns up). 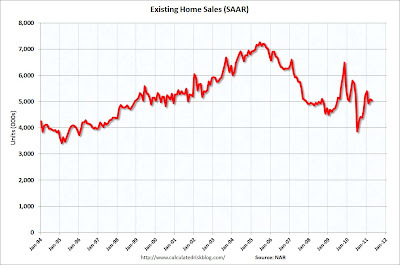 On those measures sales were down 12.9%, and median prices 5%. To be fair, I believe the last gasps of the desperate government's home credits were offered a year ago, so you have a distorted figure from last year to a degree. On the other hand, home affordability is even better this year, which is a plus. Bottom line we are years upon years from an organic recovery. Indeed, 7M+ home "owners" are living 'rent free' not making a mortgage payment and we have YEARS just to clear out that situation. (we're not even addressing shadow inventory) I read just last week that the average NY / NJ foreclosure process is now in excess of 900 days as banks are overwhelmed and/or are happy to lie about what is on their balance sheet since the US accounting board said "mark to myth" is an accepted GAAP practice as of March 2009. Hence someone strategically defaulting today in those states won't be out of the house until Christmas 2014. (process that for a moment) Repeat that across the nation - indeed rinse, wash, and repeat it. Which means we'll be well into the next cyclical recession and still have millions underwater (28% of all homes and rising), strategically defaulting, and the like. The only question is what QE we will be on by then. I say QE5. A nice graph via Calculated Risk blog showing how 5M in monthly sales compares to the past 15 years - keep in mind, the US population has grown substantially over that time. This with near record low mortgage rates, and record affordability. Sales of previously occupied homes fell 0.8 percent in April to a seasonally adjusted annual rate of 5.05 million units, the National Association of Realtors said Thursday. That's far below the 6 million homes a year that economists say represents a healthy market. Sales were down 12.9 percent year over year. Purchases made by first-time homebuyers increased to make up 36 percent of sales. That's still below the 40 percent that the trade group says is consistent with better markets. Sales to investors dropped slightly to account for about 20 percent of the market. The median sales price.. down 5 percent from the same month one year ago, to $163,700. Sales of homes at risk of foreclosure fell in April and made up 37 percent of all purchases. Foreclosure sales declined only because a large number of those homes are backlogged in the courts. A separate survey from the trade group found 11 percent of Realtors said a contract was canceled because an appraisal came in below the negotiated price. And 14 percent said a contract was renegotiated to a lower price because of a low appraisal. There's a glut of unsold homes on the market but few buyers are biting. In April, the supply of homes rose to nearly 3.9 million. 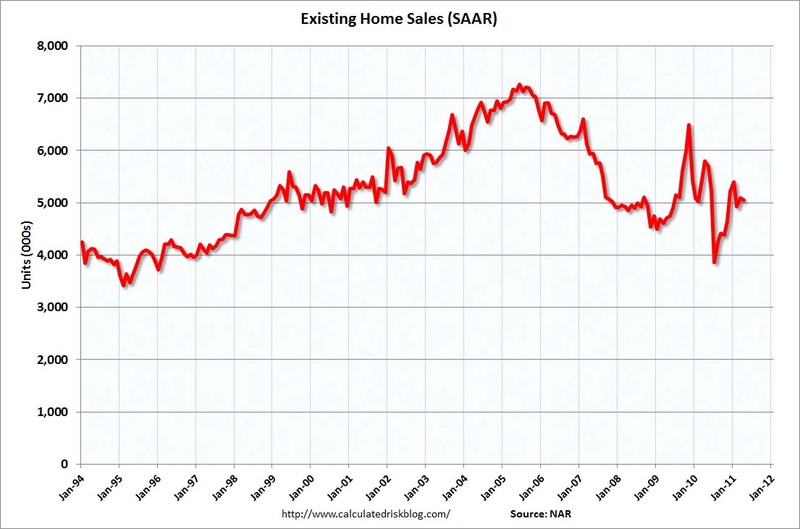 At last month's sales pace, it would take more than 9 months to clear those homes. Analysts say a healthy supply can be cleared in six months. The increase in unsold inventory "should continue to weigh on prices," said Dan Greenhaus, chief economic strategist at Miller Tabak + Co. The situation is much worse when taking into account the "shadow inventory" of homes, economists say. These are homes that are in the early stages of the foreclosure process but, because of backlogged courts or the government probes, have not hit the market for re-sale. CoreLogic Inc. in March estimated about 1.8 million homes were delinquent or in foreclosure, a so-called “shadow inventory” set to add to the unsold supply of existing houses already on the market. The Mortgage Bankers Association said Monday that about 8.3 percent of homeowners missed at least one mortgage payment in the January-March quarter when adjusted for seasonal factors. That's up 0.7 percent from the previous quarter.